Participating in Jeans for Justice is easy! Advertise Jeans for Justice in advance by email, on your organization’s intranet or any way that works for you! During Celebrate Pro Bono Week (or any day/week that works for you), October 22-28, 2017, collect donations of $5 or more from each participant and provide them with identifying stickers to wear on the day they wear their jeans. Click here to access the template (uses Avery 5160 template). Create a flyer for your office. Donations will be used to support Kansas Legal Services through the Kansas Bar Foundation. 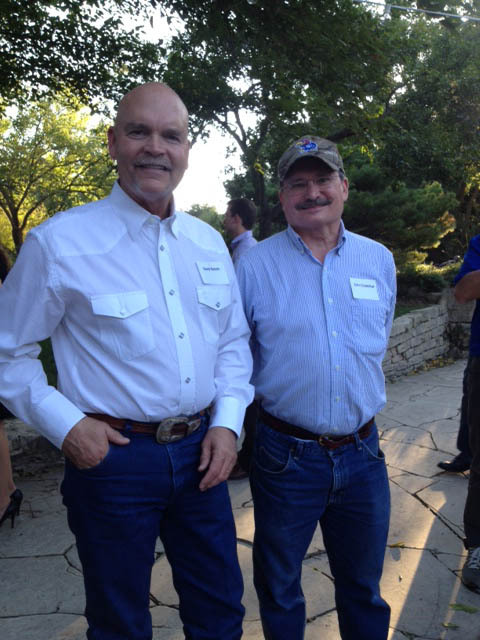 Here are a few KBA members found sporting denim at the July 26, 2013, barbecue in Wichita. Send your Jeans for Justice photos to Anne Woods (awoods@ksbar.org) to include in the Jeans for Justice Week gallery. $10 per person includes appetizers and one raffle ticket. Beverages will be available for you to purchase. Don’t have an orange tie or scarf? Be creative and come up with your own team theme! Prizes for top scoring teams, best team name, and more! Contact Jessica Evans at (785) 861-8840.